Photo courtesy MS Conference United Methodist Men Facebook. 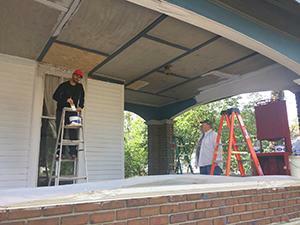 A house in Vicksburg is being renovated to provide temporary housing for homeless men. United Methodist Men in the area helped paint what will soon become the South Street Safe Place. The Vicksburg Post published an article that explains more about the Methodist connection to the home. Read the story below. Photo bottom right: Good Shepherd director Tommy Miller stands in front of the home on South Street that will one day become the "South Street Safe Place." Photo credit Vicksburg Post. 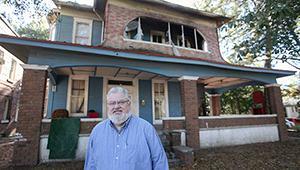 A blue two-story home at 1122 South St. will soon take on a new life as a place of refuge. The "South Street Safe Place," as the home is called, is a joint venture of Good Shepherd, Beyond the Walls Ministry and Hawkins United Methodist Church. Local residents will be able to get a look at the home and learn about the program Saturday during a block party at the home from 11 a.m. to 2 p.m.
"We'll have food, entertainment, games and fun," said Good Shepherd director Tommy Miller. According to a brochure on the project, its mission "is to create a Biblical hospitality which offers physical refuge and spiritual restoration to all God's people, brings into relationship the served and the servant, empowers the excluded and advocates for the restorative justice of God's Kingdom." "Our dream is to have it open on a daily basis, Monday through Friday, for people who need to come either to get out of the weather, have a hot meal, have a place for them to shower, have a laundry facility where, so they can wash clothes, and if needed, to have referrals to doctors or other agencies in the community," Miller said. "It's not just for homeless only," he said. "It's also for people who just need to get out and have some contact with other people -- the elderly, parents who have small children who just need and adult contact. He said the program was developed "by a conglomeration of people," but the genesis for the idea came from Vicksburg physician Dr. Bob Ford, who founded Beyond the Wall Ministries, and Hawkins pastor the Rev. Sally Bevill. "Bob Ford had a building that was open and not being used, and wanted to renovate it, and our pastor out at Hawkins has been working in this type ministry for years. They just got together and came up with the idea to see what we needed." Beyond the Walls Ministry began in 2007 as a twice a week soup kitchen that grew into a daily feeding program. At Christmas, the ministry serves dinner to 200 people. The home designated for the South Street Safe Place was one of two homes owned by the ministry to house and help homeless men. It was damaged by fire in May, providing the opportunity to renovate it for the safe place program. Miller said repairs are still being made on the house, adding volunteers will be working on the building Jan. 7 and 20 in an effort to complete repairs and open the shelter.